Going through past editions of “Quilting Arts” magazines led me to the website www.boldoverbatiks.com. To cut a long story short I was encouraged by such helpful communication (emails with Mary Scott in USA) that I purchased these absolutely deliciously gorgeous and beautiful handcrafted batiks via the web. They are such a work of art, created by real artisans with a love of what they create. These fabrics, beside making my heart-strings sing, represent excellent value too. I am itching to include these in my art-quilts, so you will see these fabrics in future posts of my work. I encourage you to go to www.boldoverbatiks.com and learn about this innovative venture with small batik cottage artists in Malaysia. I take my hat off to them for their ability to produce such lovely pieces whilst ensuring their craft continues to live on within their culture. Working once again with paints and fabric, this quilt was created as an escape from our summer heat. Being a quieter time of the year with minimal commitments, I took the opportunity to learn how to use a Riso screen. I included my first attempt in this quilt – a photo I took near Arkaroola was used to screen print the image. Can you pick it? Creating this piece aroused memories of flying over outback Australia, which occurred quite regularly during my earlier life living in Adelaide S.A.
Interestingly, my friends all “see” something different from its imagery. No surprises though that many thought of an aerial perspective, or viewing a map. 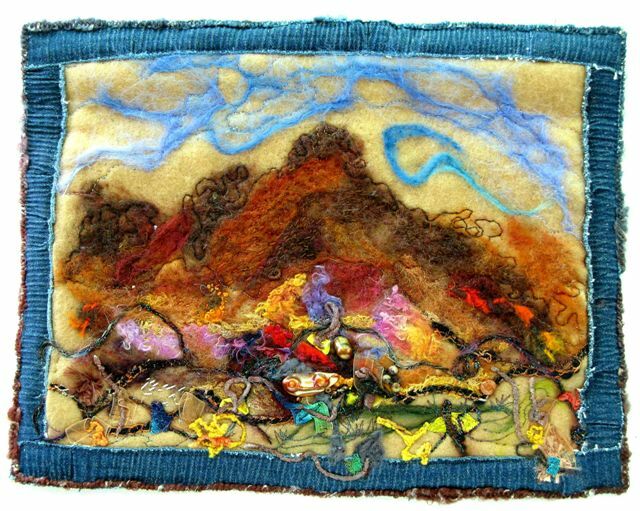 During the time I made this quilt, I was reading about the Flinders Ranges and once again was struck by the ruggedness of its rocky backdrop formed millions of years ago, its particular vegetation suitable for dry climates, and its people of the land. Time out with a friend during the end of the year holiday period, took me to town. After a few hours in a huge shop of delicious temptations, this bundle of goodies came home with me. Such earthy & delicious colours that apply to my landscape art-quilts I plan to make, and a few necklaces in mind to make for my exhibition at Balmain in July later this year. More news of this exciting event will be coming your way, so please revisit soon. Two pieces of silk are shown here. One piece was folded before adding earthy coloured dyes and popping it in the microwave. It gives landscape imagery which blows my mind on how I can use this. The other smaller purple piece, was the mop-up rag used when experimenting with a friend. Not bad too, eh? In 2010, there were 46 new posts, growing the total archive of this blog to 120 posts. There were 169 pictures uploaded, taking up a total of 59mb. That’s about 3 pictures per week. The busiest day of the year was February 9th with 164 views. The most popular post that day was Landscape Quilts. The top referring sites in 2010 were quiltersguildnsw.blogspot.com, creativedabbling.blogspot.com, kaiteyarngarden.blogspot.com, atasda.org.au, and blogger.com. Some visitors came searching, mostly for art quilts, isobel hall, landscape quilts, art quilt, and isobel hall textile artist. It is time to develop my sketching skills. Having purchased this book last month, I have been saving it for 1 January 2011. T’s time to take time to develop my sketching skills – decided I need help. This little gem of a book – The Drawing Lab – is to be my guide. The first of 52 exercises got me off to just the right start…..by creating my first sketches whilst perched in bed, yes that’s right, in bed. Pillows surrounding my pad and pen, and so I was off and away. 30 sketches of cats was needed. Here are a few of my earlier ones, and a “better” one. I am trying not to judge – especially when some these sketches were drawn with my non-dominant hand. I reckon I didn’t jump out of my mother’s womb and know how to drive! And at school I never felt I was any good at drawing or art-work. So here I am, now in my mature years, taking time out to push my drawing skills along. Whatever you are doing to help your creative spirit along at this beginning of a new decade, I wish you good luck and enjoy the ride! You are currently browsing the Crafty Quilting with Pamela blog archives for January, 2011.